What makes an efficient carpenter is having the right tool for the job close at hand. Unfortunately this means that you probably have one of every tool. To keep your tool collection organized and quickly within reach, Occidental Leather has come out with the 5588 Stronghold Master Carpenter Case. The 5588 Master Carpenter Case is a larger take on the popular soft-sided square tool tote. I used to run with one of those small cheap knock-off square totes a few years back and liked the basic design. My issue was that the version I owned was not very well constructed and it was smaller than what I needed. The Oxy 5588 seems to address both of the issues I had. Size wise it appears to be about double the size of a square tote and has a total of 45 pocket and tool holders, and it is an Oxy, so we know it is quality made in the USA. 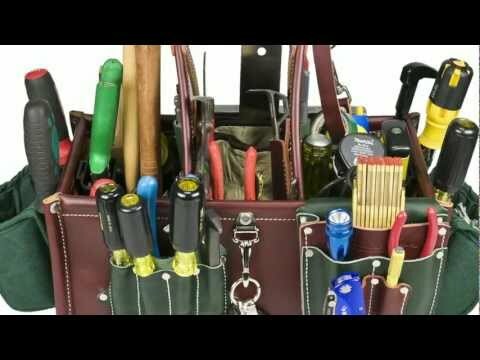 The Occidental Leather 5588 Stronghold Master Carpenter Case ain't cheap at around $250, but if your wife can spend that much on a purse, then you should be able to get on of these for yourself. Plus this bag won't go out of style.